HÀ NỘI – “Really? Are you kidding me?” Vũ Thành An screamed loudly on the phone ignoring hundreds of people who were staring at him. He was at the Nội Bài International Airport where he had just landed after a training course abroad. “I cannot believe it, it is still a dream, just a dream,” he continued talking to himself after that. 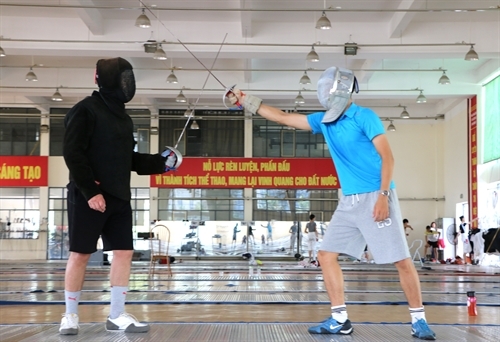 An had received a call from Phùng Lê Quang, head of the fencing department of the National Sports Administration, informing him that he had been chosen as Việt Nam’s flag bearer at the Rio Olympic Games, which will open on August 5. The athlete, who will turn 24 two days after the opening ceremony, will be competing in his first Olympics in the men’s sabre event. “It is an honour for any athlete, I know, and also a responsibility for me. I will have to try my best for the trust that people have put in me,” An said. An is one of 23 athletes of Việt Nam Team who will compete in 10 sport in Brazil. Born in 1992 into a family where nobody played a sport, An’s turning point to become a sportsman was a surprise. His height, long arms and rapid reflexes with the boy scouts made people believe that he had a good future as a fencer. He had no idea about fencing, but had an interest in a sword, and that made him agree to join the Hà Nội Fencing Club in 2007, when he was 15 years old. “Like many boys I liked to own a sword like the many knights that I saw on television. And fencing brought me that feeling. But when I wore the mask, the amour and held the sword, I knew it was not so easy,” An said. Fencing totally changed his life. From a boy who enjoyed school and football with friends, An had to follow a strict schedule of training and competing. “It looked simple, but to manage the sword as I wanted was really a challenge that took me a year of hard practice,” he said. “Sometimes, it was so exhausting that I wanted to quit, but my teammates and coaches helped me a lot and made me what I am today,” he said. 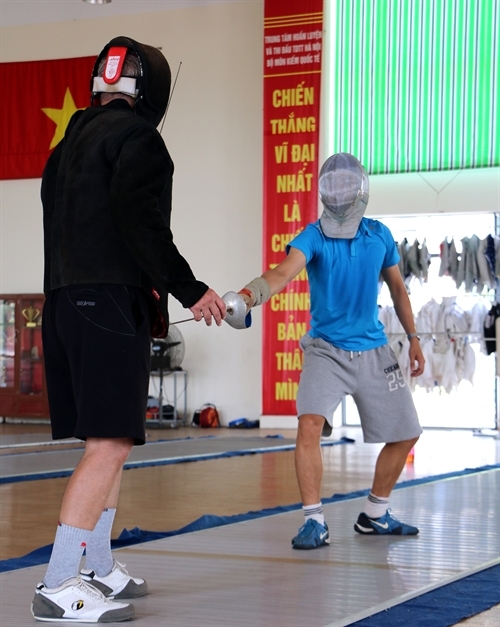 Three years later, An became one of the leading fencers in Việt Nam in the sabre event. In the same year that he joined the national team, An competed as a 19-year-old at the Southeast Asian (SEA) Games in 2011 and took home two silvers medals. Four years later, An improved and defeated all five rivals to take his individual title before he jumped to the podium again for the team event at last year’s SEA Games in Singapore in June. He then pocketed a gold medal at the Asian U-23 Fencing Championship. An reached the continental level when he won a bronze medal at the Asian competition in April, and then grabbed an Olympic berth after the Asia-Pacific zonal qualification matches in China. “Winning an Olympic berth made me happy but there was pressure as well,” An said. An and three other fencers are in Brazil practicing their last steps ahead of their competitions. However, their previous training course did not seem as good as that of their rivals’. “We are given the best conditions in Việt Nam but it is nothing compared to what we saw from our opponents. We have just up to seven international competitions per year, while those from Hong Kong, China and Japan have 16,” An said. An’s coach Sergey Koryazhkin echoed his view. The Russian expert said that it was always lack of funds that prevented his athletes from joining training courses at world fencing centres as well as taking part in international tournaments to better their technique. Koryazhkin did not want to talk much about An’s chances at Rio but confirmed he had a 50-50 chance to win a medal. “You know, the Olympics woos the best athletes. An is one of them, and he needs to focus on each match, step by step. If he wins five matches he will get a medal,” the former world champion said. An, who is world No 22, will face American Eli Dershwitz, who is seeded No 11.